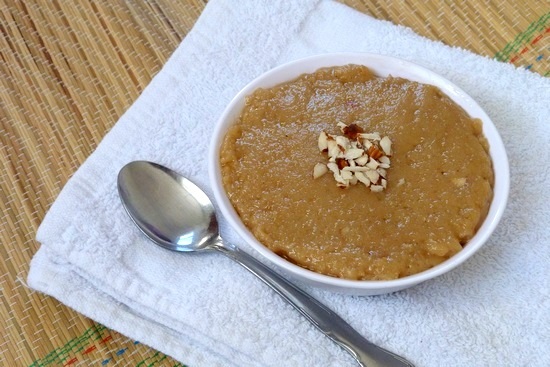 rajgira sheera recipe or rajgira halwa – a sweet dish made from amaranth flour, sugar and milk. It is flavored with cardamom powder and garnished with chopped almonds. Amaranth flour can be consumed during vrat or Hindu fasting, so this dessert. The rajgira atta aka amaranth flour is the gluten free flour. If you are gluten allergic then this dessert recipe is for you. The texture of the halwa is slightly gooey. It will stick to the spoon and bowl. But when you eat it, you won’t feel that gooey texture at all in your mouth. The perfect amount of ghee vs flour makes the halwa smooth and less gooey. So don’t cut down the amount of ghee here. As Navratri is going on right now. Many people keep the fast on these nine days for matarani. So here I am with the fasting dessert recipe. Today I am sharing rajgira halwa recipe. While you are fasting, you feel low in energy. So that time, make this rajgira sheera and eat a small bowl of it. You will feel full and energized because of the ghee in it. This is my mom’s recipe. She used to make it for me while i was keeping the gauri vrat fast in my childhood days. This was my favorite dish those days. In Gujarati it is known as rajgara no sheero. It is recommened to eat this rajgira halwa warm. You can have the chilled one but the warm tastes best. If serving it later or having the leftover next day, you can warm this up in microwave. 1) Take milk and sugar in a saucepan, Turn the heat on medium and just warm it up. No need to boil. Alternately you can warm up the milk-sugar mixture in the microwave as well. 3) Once hot add rajgira atta. keep cooking with constantly stirring with spatula. Also keep an eye on the milk as well. 4) Roast the rajgira till you get the toasted, nutty aroma of the flour. It gets slightly brown in color. It will take about 4-5 minutes. There are few signs that you know flour is roasted well – 1) you get the nutty aroma. 2) it gets slightly loose and you will feel light while you’re stirring it compared to the beginning. 3) ghee starts to ooze out slightly from the sides. 5) Once flour is roasted, add the warm milk-sugar mixture. Be Careful it will be bubbly and it may splutter. 6) Immediately mix well using spatula. 7) Continue cooking with stirring constantly till it gets thick, all the moisture is evaporated. And the ghee starts to ooze out from the sides. Also the sheera will leave the sides of the pan. Then turn off the stove. 8) Lastly add cardamom powder and chopped nuts. 10) It tastes best when served warm, so Let it cool down slightly then remove it to a serving bowl. Serving suggestion: During the fasting day (vrat or upvaas), have a small bowl of sheera, you will feel full for few hours. Take milk and sugar in a saucepan, Turn the heat on medium and just warm it up. No need to boil. Alternately you can warm up the milk-sugar mixture in the microwave as well. Once hot add rajgira atta. keep cooking with constantly stirring with spatula. Also keep an eye on the milk as well. Roast the rajgira till you get the toasted, nutty aroma of the flour. It gets slightly brown in color. It will take about 4-5 minutes. Once flour is roasted, add the warm milk-sugar mixture. Be Careful it will be bubbly and it may splutter. Immediately mix well using spatula. Continue cooking with stirring constantly till it gets thick, all the moisture is evaporated. And the ghee starts to ooze out from the sides. Lastly add cardamom powder and chopped nuts. Mix well. Thank you Kanan. I love this Sheero. My mom used to cook for us during EKADASHI Upvas. We used to love it. Today i get to know that it is Amarnath family. Now we appreciate the benefits of the indian cooking. yes, our ancient cooking traditions are healthy and beneficial. Just one work thank you so much and an awesome easy recipe! Thanks a ton!